What Makes A Game 'Perfect For Switch'? Everyone wants pretty much every game to come to Switch, but what are the criteria for the Perfect Switch Game? On this week’s Kotaku Splitscreen, let’s discuss. Journalist and producer Alanah Pearce joins the show this week to talk about the big new No Man’s Sky update, the director of Guardians of the Galaxy losing his job, and what makes a game great on Switch. Some of the criteria we came up with include “low-impact,” “easily readable,” and “you can accomplish something in a short session.” Kirk and I also talk about my continued D&D adventures and the big new secret that just hit Destiny 2. Jason: What are the attributes that make a video game perfect for the Switch? Everyone’s always saying, ‘This would be perfect on Switch’... What would make a game perfect or not perfect on the Switch? Kirk: It’s tricky because everyone says that about every game, but I think we can nail down a few concrete things and actually come away with a list. I was playing Captain Toad’s Treasure Tracker, which is perfect for Switch. I would say, the first thing I think is important is it exists in some way in a bite-sized, digestible format. Small levels, or things that you can play on the bus, things that lend themselves to being played portably. Jason: That’s the opposite of Zelda. Kirk: Yeah, but is Zelda perfect for Switch? Kirk: You think so? I think Zelda’s a really good game, and it’s cool you could play it on Switch, but I dunno, if someone announced Zelda and showed it, would people say, ‘Wow that game is perfect for Switch’? Alanah: When you’re saying bite-sized, the game that comes to my head when you talk about being perfect for Switch is Thumper. That is a game that’s satisfying to play really close to you, because you feel like you’re really immersed in the soundscape that is that game, but also if you fail you respawn immediately. And I think that makes it this constant exciting feedback loop — Thumper is a game that after playing it on Switch and other things, I only ever want to play it on Switch. But I also really want Persona 5 on Switch, because it’s a really long game that I keep being like, ‘Well I wish I could take it with me,’ and Zelda falls into that category. Kirk: OK, my bite-sized thing, maybe that doesn’t work. Let’s keep thinking here. So Stardew Valley is amazing on Switch, I think of that as one of the ideal Switch games. The difference between playing it on PC and Switch is that the game has so much repetition, and it operates at a low burn. Is that maybe something that makes a game perfect for Switch? Jason: Something you can do while watching TV or while doing something else I think makes it perfect for Switch, but that’s not the only criteria I’d have. Alanah: I’m going to disqualify anything that has long loading screens, I think is automatically not great for Switch, and again I’m still thinking of it as a handheld platform, so if you have long loading screens, I don’t want to play you on Switch... We can cross that out. Kirk: There are games that are cool to play on Switch, like Skyrim is one, but I don’t think of it as being perfect for Switch and one of the reasons is, there’s a lot of loading, a lot of wandering, a lot of downtime. It takes a long time to get to the good stuff. 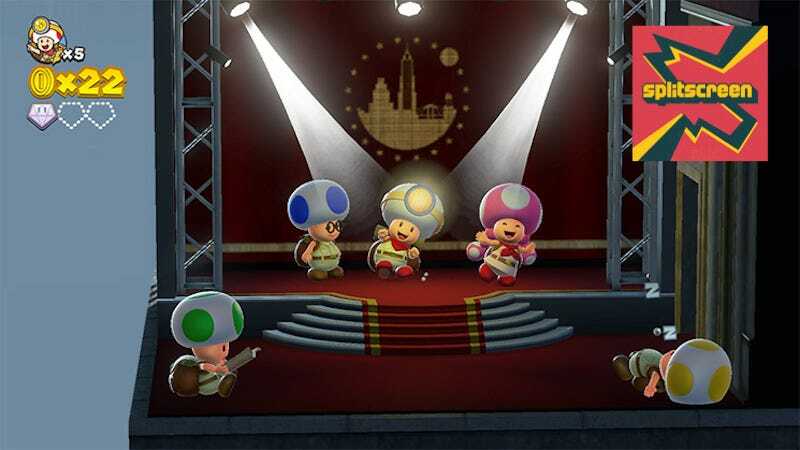 And that to me makes it feel— It’s cool to play a game like that on Switch, but it doesn’t have the Captain Toad or Stardew Valley thing where there’s constant engagement. Jason: Maybe it’s not necessarily bite-sized sessions, maybe it’s just that you can accomplish something in a bite-sized session. So it doesn’t have to be broken down into levels, but even with something like Zelda, you can hop on for 10 minutes, get something done, and then put it down.